Today, my son Jordan will be presenting his award winning essay on “How to Make a Difference in Your Community” at his school’s enrichment fair. Video will be posted on YouTube and I’ll provide the video and link tomorrow. As Jane would say, I’m qvelling over him!!! Now, let’s see if anybody did anything to qvell about. Brad didn’t play in yesterday’s Dodgers’ victory over the Phillies. Ryan went 0-for-3, walked once and struck out twice in the Brewers victory over the Marlins. This lowered his average to .333. Craig didn’t pitch in yesterday’s extra-inning Twins victory over the Tigers. Scott, yesterday’s Macher of the Day, had a day of rest. 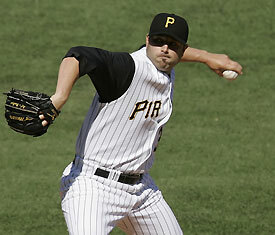 John, who might have regained his form, pitched a scoreless 8th inning in yesterday’s Pirates win over the Cardinals. His inning of work also included a strikeout. As a result, John lowered his ERA to 5.74. Gabe didn’t play in yesterday’s Rays victory over my O’s. Ian went 0-for-3, but walked three times and scored on a Josh Hamilton homer. His average is now .319. In Jason’s shortest outing the year he allowed a ******** nine runs and 10 hits and 3 walks over 3 2/3 innings!! His record fell to 4-3, but his ERA rose to 5.40. I guess Jason thought this game was like a Little League game in which the coach pitches to the kids! or he realized that being a starting pitcher for the Rockies is quite scary! Scott faced only one batter, Jay Bruce, who walked and eventually scored in the Reds’ 7th inning. That 5-pitch walk raised his ERA almost a point to 2.70. Maybe he was wearing the Chai 5 hat too tight or something! I like how Scott feldman got “a day of rest.” Very funny. I glad you like that Melissa. I try to keep things fresh. A new posting will go up later tonight that includes Jordan’s essay presentation.